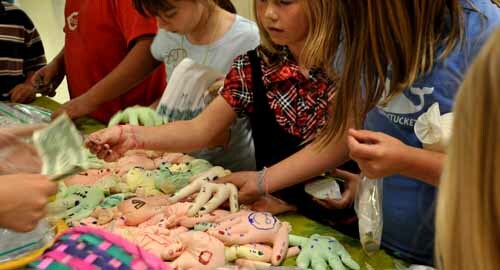 Flubber Hands are the latest invention in my family’s second journey into the world of mini-mall. 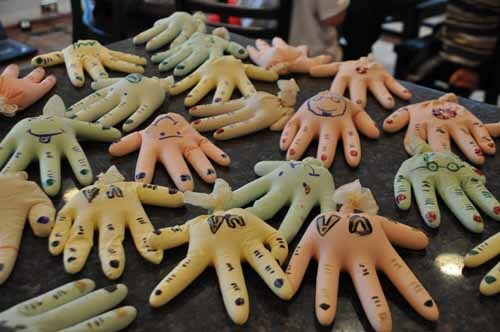 Unique, and truly one of a kind, each latex glove is painstakingly filled with handcrafted flubber. (Yes, we do know the recipe by heart now.) 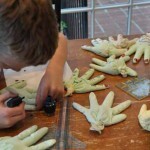 Care is taken to ensure that each finger receives an equal distribution of flubber. 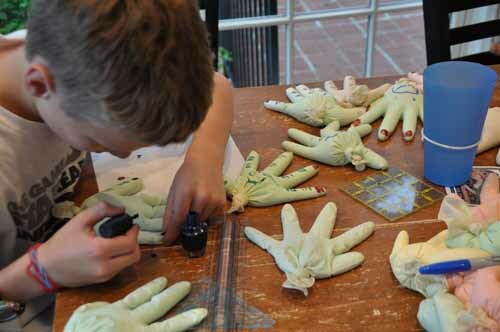 Once assembly is completed, the flubber hands are washed and dried, before undergoing extensive beauty treatments. Nail polish, lipstick, and rouge. Some even appear as your favorite sports team. Today’s first day sales resulted in the sale of 51 gloves, along with some bags of peanut-free puppy chow. 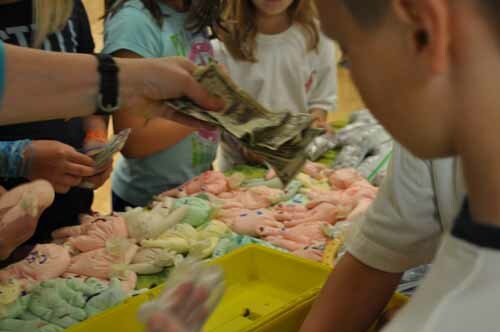 The production crew is currently working overtime to ensure a fresh supply of hands will be available at tomorrow’s sale; and the next day’s sales. 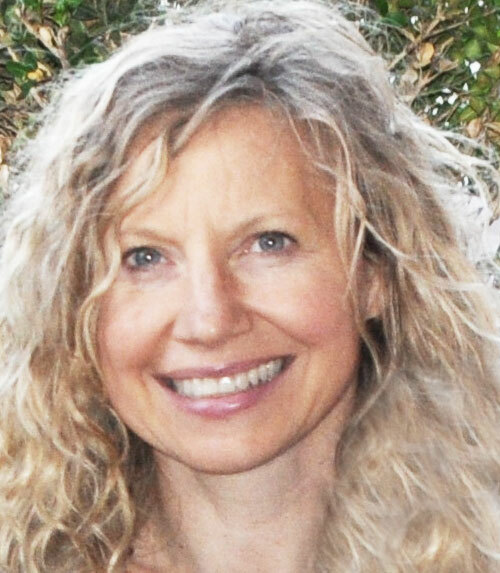 Until this week, I was under the mistaken impression that I was already doing an incredible job of getting through the day not getting everything done. Mini-mall takes me to a whole new level. 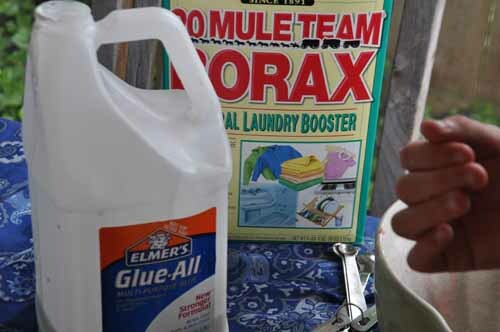 Put the borax in 1/3 c of warm water and stir until dissolved. 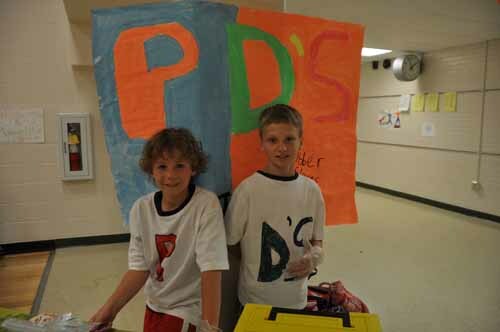 Then add several large squirts of food coloring and set aside. Pour the remaining 2 cups of water into a container and add the 2 cups of school glue. Stir until dissolved. 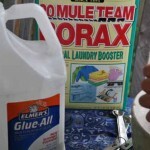 Add the borax solution to the glue solution. Mix with your hands. Keep working for a few minutes for all the water to be absorbed and reach the right consistency. Open latex glove, and shove flubber into palm, and push into fingers.